Eurocom, (www.eurocom.com) is launching the 15.6” fully upgradeable Racer 3W Mobile Workstation with NVIDIA Quadro K1100M professional graphics solution for on the go professionals in need of a small and powerful Mobile Workstation with a great price to performance ratio. The EUROCOM Racer 3W is a high quality, custom built, fully configurable and fully upgradeable Mobile Workstation laptop designed for the most demanding professional users. The new NVIDIA Quadro K1100M graphics solution lets users work with larger models and assemblies and improves interactive manipulation performance during the design process due to its 384 CUDA Cores and 2 GB GDDR5 memory. Fast approximate anti-aliasing and temporal anti-aliasing film-style technologies gives users outstanding image quality for content creation and design reviews without compromising the interactive experience. “The philosophy behind the EUROCOM Racer 3W is a simple one; to provide an affordable, lighweight notebook based workstation computer that is equal in performance, function and features to a workstation desktop system while being easy to carry around. The ultimate goal here is to completely standardize desktop workstation and notebook technology resulting in the elimination of the need for desktop systems.” Mark Bialic, Eurocom President. The Racer 3W Mobile Workstation is designed for professionals who frequently travel and need capable hardware to fulfill their professional commitments. With a weight of only 3 KG the EUROCOM Racer 3W is perfect for engineers, designers, students and professionals kinds that are required to travel to and from customer or work sites. 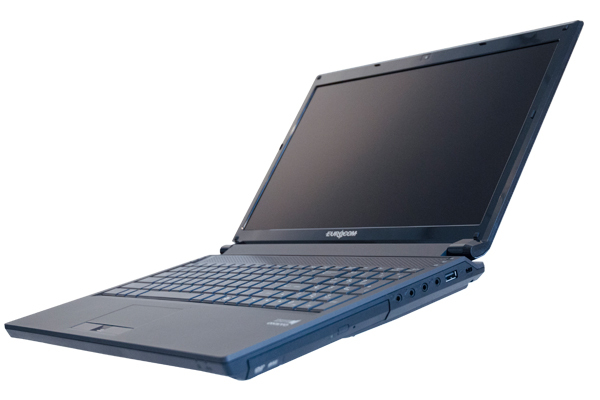 A Eurocom Mobile Workstation is the ultimate high-performance computer system with advanced graphics capabilities, large storage capacity, powerful processors and unlike many competitors are fully upgradeable and customizable. We understand that redundant, fast storage is extremely important to clients who carry around their professional data on their workstation, that is why the EUROCOM Racer 3W supports up to 4TB of storage with four SATA3 (6Gb/s) drives, two of them being mSATA solid state storage drives with RAID 0,1,5,10 capability for the best in performance, capacity and redundancy. The EUROCOM Racer 3W has multiple choices of matte or glossy, 15.6” Full HD 16:9, 1920x1080 displays that can be professionally calibrated for true to life colour representation.